20 minute starter task: Produce a fact sheet to show how each of the effects above are linked to earthquakes. Your fact sheet should include a brief description of the effect, how it links to earthquakes, a recent example and an image. 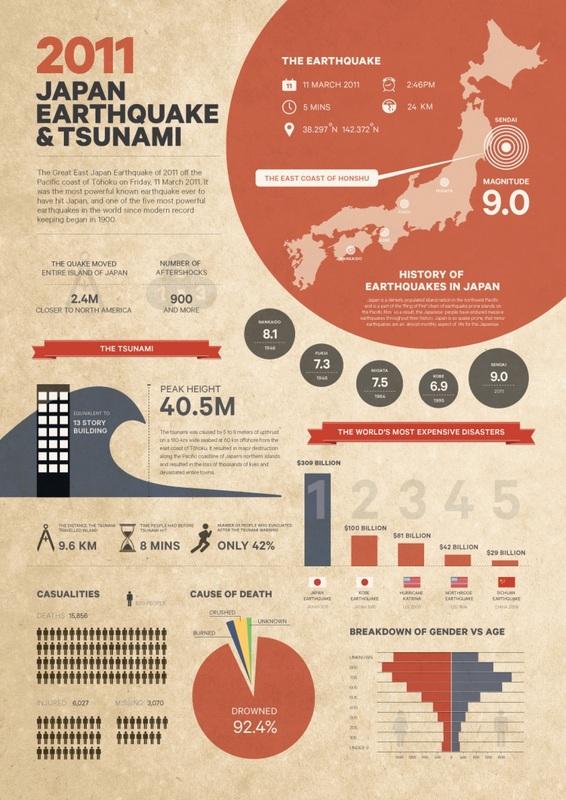 Objective: To build up a case study of the earthquake and tsunami in Japan in 2011. Step 1: Use the worksheet to firtly draw out the plate boundary characteristics off the coasline of Japan. This link may help you. Step 2: On the second space on your worksheet, complete the sketch outline of Japan using this outline map. Add a north arrow. Mark on the location of Tokyo, Sendai and Fukishima Nuclear Power Station. Label the main islands. Step 3: Mark on the location of epicentre, the magnitude of the earthquake, the depth of the focus and the time that it occurred. Use this link to help you. Step 4: Use the first video to the right hand side to add a title the sheet you have drawn the map on - which includes the name of the earthquake and the date and time it occurred. Who was affected by it happening? Step 5 - Click here to be taken to some before & after photos showing the devastation caused by the earthquake and subsequent tsunami. Choose one image of before & after and take a screen shot and paste both into a Word document. Then comment what the likely effects would be on the people in that area. Step 6 - Click here to be taken to a list of the impacts of disaster. Add these to your comments in Step 5. Although a secondary effect (something caused by the earthquake that happens later) of the Japanese quake was the tsunami, this in itself caused another secondary effect. Research the Fukushima nuclear accident and watch this video from the BBC. Create a fact sheet that shows the causes and short term (up to one week) and long term (years in the future) effects of the nuclear accident. Objectives: To carry out an independent study of the Haiti Earthquake and find out what made it very different from the Japanese quake. Task 1 - Download these two documents (thanks to Greenacre School) and complete. Step 1: On a sheet of blank paper/word document, draw a sketch outline of Haiti/copy & paste an outline map. It should be as big as possible on the page. Add a north arrow. Mark on the location of Port Au Prince. Label the neighbouring country. Step 2: Mark on the location of epicentre, the magnitude of the earthquake, the depth of the focus and the time that it occurred. Use this site to help you. Step 3: Use the first video to the right hand side to add a title the sheet you have drawn the map on - which includes the name of the earthquake and the date and time it occurred. Step 4: Use the map below to add the boundaries of the tectonic plates to your sketch map. The earthquake occurred on the boundaries of which two tectonic plates? Step 5 - Find out what the total population of Haiti is using the CIA World Factbook. Then watch the second YouTube video above to research the chequered history of the country. Make notes on why the country finds itself in such poverty today. Step 6 - Click here to be taken to a list of the impacts of disaster. Make a note of these in your case study. You must now research the short & long term responses to the Haiti quake. Short term refers to the hours and days after the quake itself. Long term refers to the months and years. Objective: To gain an understanding of how planning and preparation for earthquake events can reduce loss of life. Task 1 - The class should study this presentation and see if they can guess which country the earthquake occured in. Are there any clues in the photos? Task 2 - Surviving Natural Hazards - This lesson will take approximately 3 hours to complete and the resultant presentations may take an extra hour. The teacher will need to bring in the list of preparation items on the presentation to play the game with the students. You will need the following resources for this set of lessons. Feeding back to the the groups. You should give your completed mark schemes back to the group and then complete the following self review based on the feedback received. Task 3 - Watch the video underneath. Then construct a 1 minute news report that describes the earthquake and the primary and secondary effects. Thanks to GeoDebs on SLN for this one.